Configure this tactical tanto knife just the way you like it! Multiple weapons in one, this knife is more than it appears to be at first glance. Primarily, it is a combat knife with a black coated stainless steel blade, combo edge, protective guard, tanto point and ABS handle. But, once you unscrew the "skull crusher" spike at the bottom of the handle, a removable kubaton is revealed. The kubaton has one long spike which is always fixed in place. 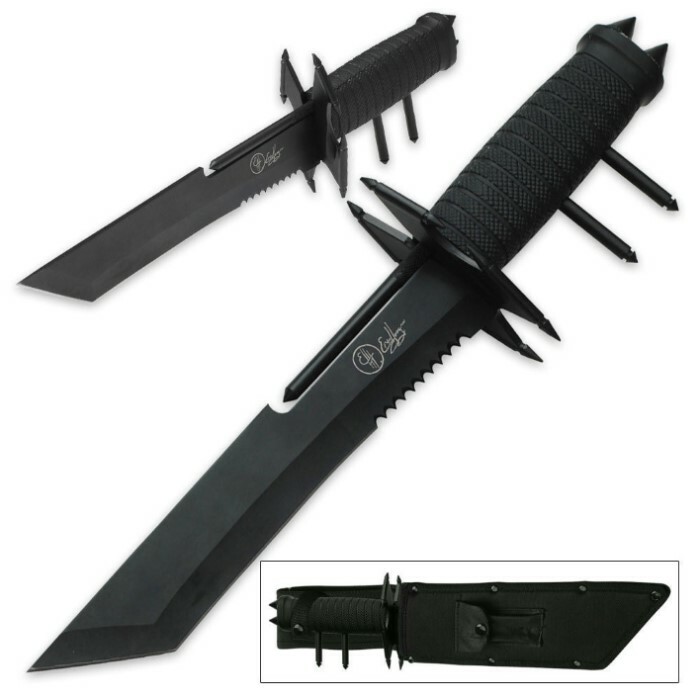 Two shorter spikes are included, and securely attach to the kubaton. You can add hand spikes to the knife, or use the kubaton and knife separately while dual wielding. Includes custom nylon sheath with spike pocket and belt look. 13 in. overall. Recieved this last year and the only complaint I have is the scabbard, very poor construction and the snap broke off as soon as I unsnapped it. Overall the blade is great and I would recommend it to anyone that asks. It's a good big knife except for the fact that the sharpest parts are the spikes. It was kinda hard to know what to do to actually take out the kubaton because the instructions cut out right then. Also unless you want it for just a knife or just a kubaton, it's really uncomfortable to take out the kubaton then hold the knife. It should almost come with just an extra grip. Like when you buy a BB gun it comes with 2 clips and 2 grips. this is a great knife. i love its multi purpose useage. all parts of the knife is sharpe and ready to go. very so worth the money spent without question.